We sat down with Ashley to learn more about this locally-owned business that is becoming hugely popular in the DMV. What is Vegetable & Butcher? Vegetable and Butcher is a subscription-based service that has found the perfect balance of tasty AND nutritious (and convenient!) – chef designed, dietitian approved, thoughtfully prepared meals delivered directly to your doorstep. What types of meals does V+B provide? V+B’s menu rotates weekly, changes with the seasons, and offers plant based and paleo-friendly options. 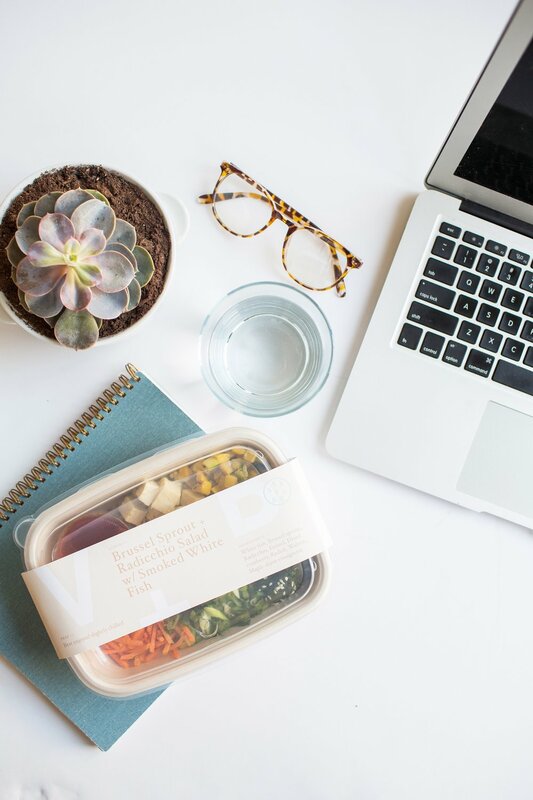 Instead of following a specific diet philosophy, V+B focuses on using clean and wholesome ingredients. All of the meals are dairy- and gluten-free and packed with loads of vitamins, minerals, and important micronutrients. To sum it up, it's good food that's good for you! OK, I’m interested. How does this work? The V+B subscription is super flexible. You choose which meals you'd like to receive (between breakfast, lunch, and/or dinner) that best suits your schedule. You can select between 2, 4, or 6 days of service and if you'd like the Vegetable Basket (vegan-friendly) or Butcher's Box (non-vegan, paleo-friendly). Without prepping, cooking, and cleaning there's more time for doing things you enjoy (like going to Ascend!). We deliver three times per week so everything is fresh, and it's ready for you when you wake up. Oh, and delivery is free! Ashley – We trust your expert opinion. Why do you choose V+B? I first came across V+B on Instagram (of course!) and was drawn to their food philosophy, which aligns with my personal beliefs about food. I love the fact that they care so much about using quality ingredients to make real food, rather than promoting any extreme diets or trends. I’m happy to promote this philosophy as a Brand Ambassador. For subscribers, I like how V+B gives people the flexibility to choose what works best for them. You can have prepared meals when you want or need them most, and still have space in your week to cook at home or go out with friends since you choose the desired frequency. It offers a great solution for those who want a variety of healthy meals but don't have the time or means to regularly shop, cook or food prep. It’s all about finding the right balance. Of course, the food is delicious too. It's funny how people are often pleasantly surprised to learn how good plant-based meals can taste! The pricing structure is tiered, so the more you order, the less the "per-meal" cost will be. For the Weekly Subscription, prices start at $11.00 per meal (plant protein) and $12.00 per meal (animal protein) if you order breakfast, lunch + dinner for the entire week. The most you'll ever pay while subscribing is $12.50 per meal (plant protein) and $13.50 per meal (animal protein). Subscription plans can be paused, modified or cancelled at any time. This Saturday, I’ll be providing samples of two dishes – breakfast and lunch - so come on by and grab a taste! I’ll also be handing out promo cards and raffling off a $25 V+B gift card, so don’t miss out!